I wasn't going to write one of those 'New Years resolutions' type posts, but I've seen a couple of other bloggers take note of their goals, plans and dreams for the year which got me thinking about where I'm at. I thought I might actually find it helpful and therapeutic to write it all down, especially as my head is ALL OVER THE PLACE at the moment. I'm finding it really hard to get back into the swing of things and January has been super challenging so far. There are so many distractions around I need to refocus my mind and intentions for the year. Having been blogging for 2.5 years now it's a good time to step back and see what I have achieved and want to achieve. It's time to ramp things up and take the next steps. Having always done the blog as a bit of an aside hobby, I want to refocus and work out which direction to take it. 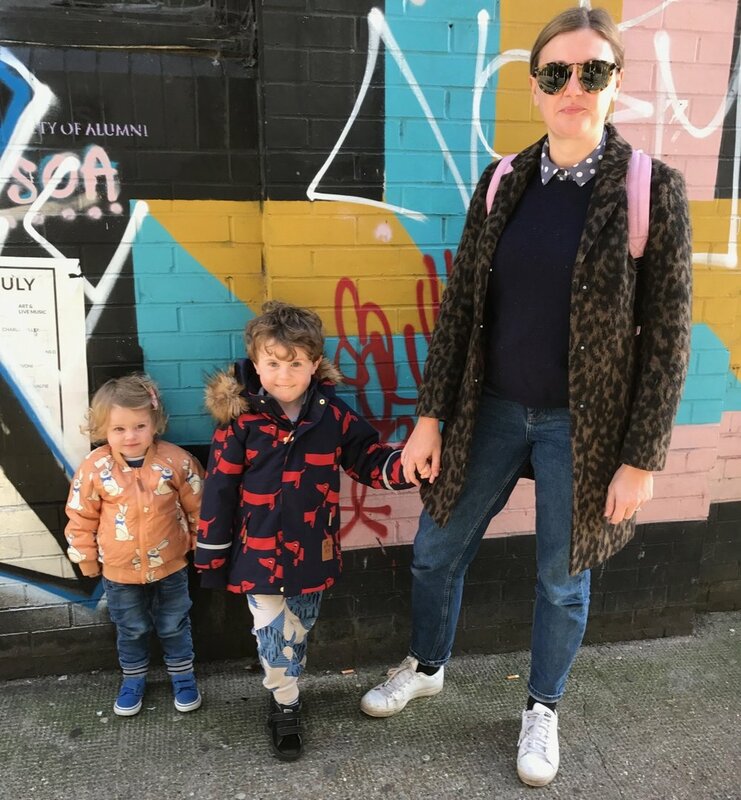 Having tested the water across a broad spectrum of lifestyle areas - from kids fashion, mum fashion, parenting articles, interiors, entertainment, supporting small independent brands, press days and product reviews - I'm in a good place to evaluate what you all like best. For that reason watch this space for a Survey Monkey which I will be sharing soon and will rely on all your honest feedback to make sure I deliver the best blog I can this year! I need your help in what you want to see more of and hear more about from me. I'm also going to be investing in a camera (Olympus Pen, I know very unoriginal as it's a bloggers favourite) to up my photos and their quality by selling some old stuff that we have cleared out from our house. I'm going to try to go to less events and make sure the ones I go to are really relevant and worth my time, being incredibly time poor means I really have to concentrate on what fits with Finlay Fox. I need to make sure I am creating enough good content and also have the time to plan it a bit better! I am keen to do some collaborations with more people and brands and continue to support small brands and independents this year too. Getting out and meeting people in real life, working with other bloggers and sharing support and advice is really important to me - the blogging community is amazing and I need to make sure that we continue to champion and support each other. There is also a lot of chat around at the moment about making money as a blogger/ influencer and how the landscape is changing. I do intend on monetising my blog and instagram this year as I do believe in the value I can offer brands, the influence I have on people, plus this is my job now and I do need to support my family! Blog posts and photos take time, especially when doing a lot of it around the kids and I have worked really hard to grow my platform. I will as always state if it is an ad or sponsored post and only work with product and brands I truly love and believe in. I want to stay authentic and honest, it is SUPER important to me. I'm no interiors expert in any way but I think the trend towards real homes is a good one. Having done some tasters of my home and having had a really positive reaction I have decided I'm going to document my loft conversion renovations #FinlayFoxRenovations when the work starts towards the end of next month. I will be sharing the journey, my finds and of course the end result!! Feeling very excited and lucky to be 'adding another layer' to our house as Finn puts it. This means staying in London for a bit longer as we do still have itchy feet for space outside of London, but I won't go into that now! We have a couple of holidays planned this year. With the school holidays tying us down to weeks of time to fill it is really important to me that I try to make sure we make the most of it with quality family time and visit and explore some new places. Having spent a lot of my childhood in Singapore with holidays in other parts of Asia, I have high hopes that in the next couple of years we are feeling braver with long distance fights with the kids and explore further afield with them. It's so important to understand different cultures and not be afraid to open the world up to young eyes. Violet has 2 days a week in nursery and this is most likely to be all the child free time I have until she turns three next year. Last year I learnt so much - I took on and committed to too much so I am learning to say no more and simplify my life where I can. Time to do life admin and run the family ship is a full time job in itself but it is important to me that I still have my own identity and make my own stamp on the world. It is a constant battle to juggle all the balls but I hope this year I will manage it better and still have good quality family time with no regrets. Exercise - I hate it but everytime I do it I feel SO much better about myself and it is a massive sort out, physically and mentally. I started the year at a health event with Mummas Health Hub (please go check her out) and I do, like her, believe that we can fit in even just a tiny bit of exercise every couple of days, it truly makes a big difference. Self care is super important to me and taking it easy on myself is no bad thing this year. I have signed up to do the MUTU programme - a course designed to help you sort out and strengthen your core and pelvic floor. Watch this space - I will be writing up my progress and review on it on the blog next month. Body confidence is still a real passion of mine (having taken massive inspiration from Natalie, Style Me Sunday last year) and is an area I am keen to continue championing. I would like to do a big swimwear focus this half of the year too, helping mums find some swimwear they love and feel confident in. Right, now I had better crack on, honestly this has been the best brain dump... 2018 lets do this!! !